ICTO has fixed the button display of Quiz activity in iOS devices and enhanced the Quiz activity’s layout in UMMoodle. This enhancement was suggested by CTLE’s academic advisors. After the enhancement the visibility of the buttons and text are improved. This provides a better experience regardless of the device in use. Here is the list of changes made to the Quiz activity. Fixed the problem of displaying “Check” button in Safari web browser. Changed the name of “Check” button to “Check Answer” and changed its colour to light red. Changed the background of text to white since the light blue background around the questions and answers is problematic. Changed the colour of “Next page” button to green. 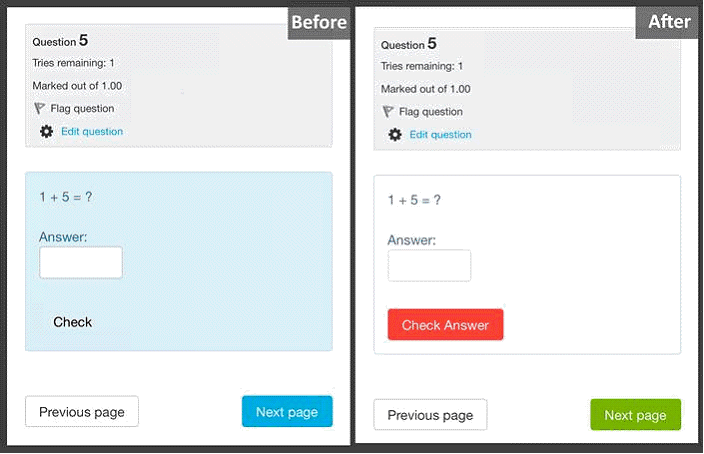 Academic staff and teaching assistants can learn how to set up a quiz in UMMoodle or get help with UMMoodle from articles in ICTO’s Knowledge Base.